I was recently contacted by Tribute Books with a great opportunity – to interview Andrea Nepa, adoptive mom and author of Red in the Flower Bed: An Illustrated Children’s Story about Interracial Adoption. I read the book and asked Andrea a few questions. Andrea Nepa and her husband adopted their daughter Leah from Vietnam in 2001. Although she is a dietician, she took on the challenge of writing and illustrating a children’s book for her daughter. 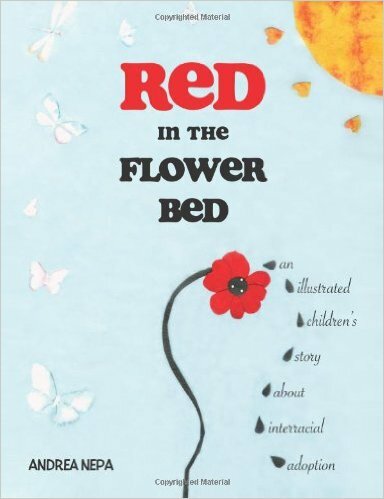 Red in the Flower Bed was published in December 2008, and has received several positive reviews. In the book, a seed who is unable to grow in the garden she starts it travels the world until she settles in a far off flower bed. The other flowers are anxious to see what the new flower will look like, who she will be. When the seed sprouts, she becomes a beautiful red poppy. Though there aren’t any other red poppies in the garden, she and the other flowers are happy because she completes their rainbow of colors. RobynC: Has writing always been a favorite pastime? Andrea Nepa: I’ve always loved to read, but creative writing isn’t something I do all that often. RC: When did first think about creating a children’s book? AN: I was inspired to write this story when my daughter was about 3 years old. We felt so lucky to have such a beautiful little girl from all the way on the other side of the world. Her background was a mystery to us and when she asked us questions about her birth mother we didn’t know the answer. She seemed to have feelings of abandonment when she was able to understand the concept of adoption, and it was important to make her feel loved and wanted. RC: How long did it take the idea to become reality? AN: It took a few years to finish writing the story. I would think about it and write a little then put it away for a while. I didn’t intend on illustrating it, too, but I wanted the pictures to be appealing to children and put the words into pictures. So I decided to make it look the way I wanted it, which took another year or so. RC: The illustrations for the book are beautiful. What techniques did you use to create them? AN: I used a collage technique for the illustrations. My favorite children’s book illustrators are Eric Carle and Lois Ehlert, so I was inspired by their styles. RC: Finally, a more personal question, because it’s one I get all the time. Are you and your husband thinking about adopting again? AN: We originally planned on having a sibling for our daughter Leah, but when we started to seriously think about adopting again she got very sick so we put things on hold. Now not only is Vietnam closed for adoptions, but we feel that at this point she would be too much older than an infant or toddler, plus we really can’t afford it anyway. So that is the honest answer (I don’t mind when people ask).